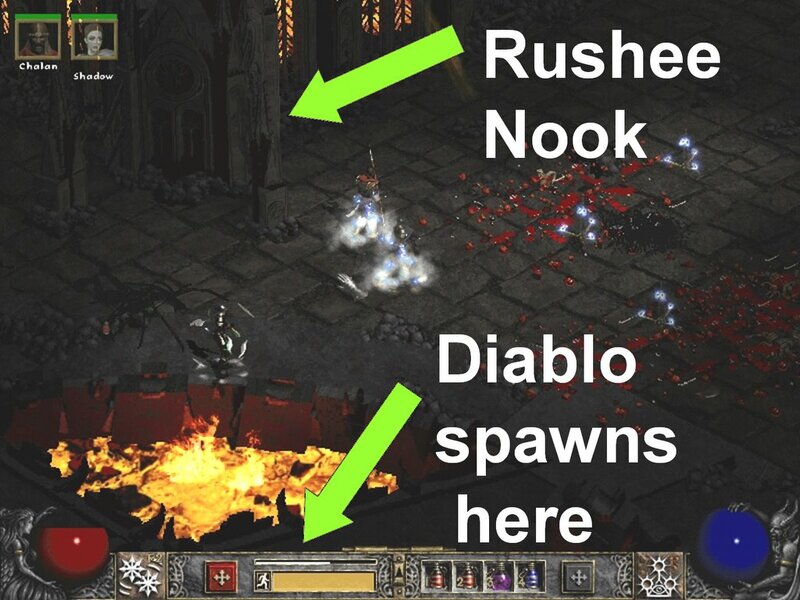 What follows is a set of instructions for accumulating runes in the online game Diablo II: Lord of Destruction. Certain runes are the rarest and most valuable items in the game. 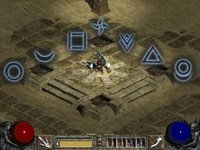 This guide gives step by step instructions for gathering runes by repeatedly creating characters and performing the hellforge quest in each of three difficulties for each character. "Duriel Mule" - a character that has touched the Summoner's book, and inserted the staff into the orifice, but done no other Act 2 quest activities. If a rushee dies in a quest area, remain dead (i.e. 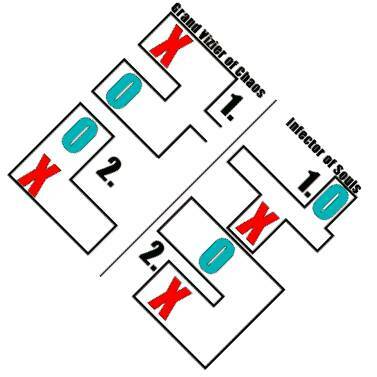 don't hit escape) until the quest is completed. You will get credit for the quest. For Normal difficulty, select "create new character" from the character screen. All N-1 rushees in the game have now been converted from "New" to "Andariel"
Primary rushee gets viper amulet. Do not leave the Altar Room until the Altar animation finishes. Otherwise the quest might be botched. If a Duriel Mule needs to be created for this difficulty, save the amulet. Rusher saves screen shot of Arcane Sanctuary waypoint, with map positioned to show summoner location. All rushees verify that they can take the portal to the Canyon of the Magi waypoint. Andariel rushee DOES NOT ENTER GAME YET! Rusher clears chest area of Maggot Lair level 3 (this is the only time that Maggot Lair must be completed). Everyone avoids talking to townspeople and any other quest triggers while this character is in game. N-1 rushees complete this difficulty. N rushees can complete Act 2 in one pass, compared to N-1 rushees for most other acts. 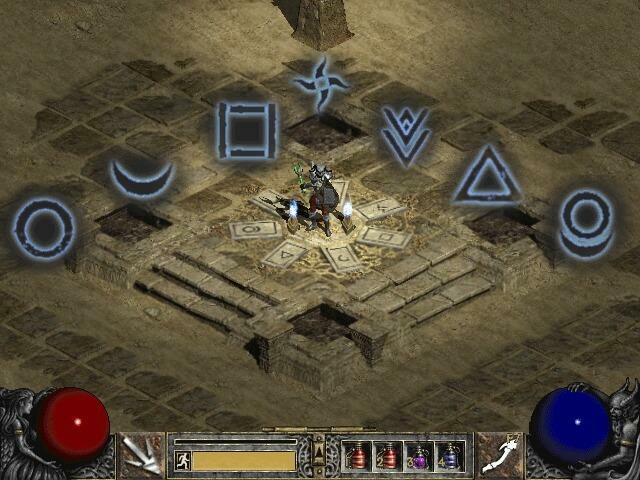 Summoner rushee enters game, and identifies true tomb symbol. If symbol does not show in the quest log, talk to Cain and visit the Canyon of the Magi waypoint. If Jerhyn cannot be seen in town, send everyone back to Act 1 temporarily to reset the Act 2 town. Jerhyn must be available in town. N-1 Andariel rushees enter game and join party. Summoner rushee walks through chamber and talks to Tyrael. All Rushees pick up their Horadric Cubes near the dead council, if they need one. 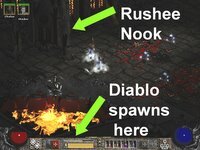 Rusher A kills Diablo, avoiding wandering too far from spawning spot. All rushees move to next difficulty, where they are now "NEW"
Make sure rushee is not partied with anyone who needs the hellforge quest. Possible hellforge runes by difficulty. There is an equal chance (1/11) of each listed rune dropping at each hellforge quest. Runes that cannot be obtained from hellforge rune drop: Vex, Ohm, Lo, Sur, Ber, Jah, Cham, Zod. It would take 256 Gul runes (and some gems) to cube up one Zod rune. This rant is reawakened from the early 1990s. 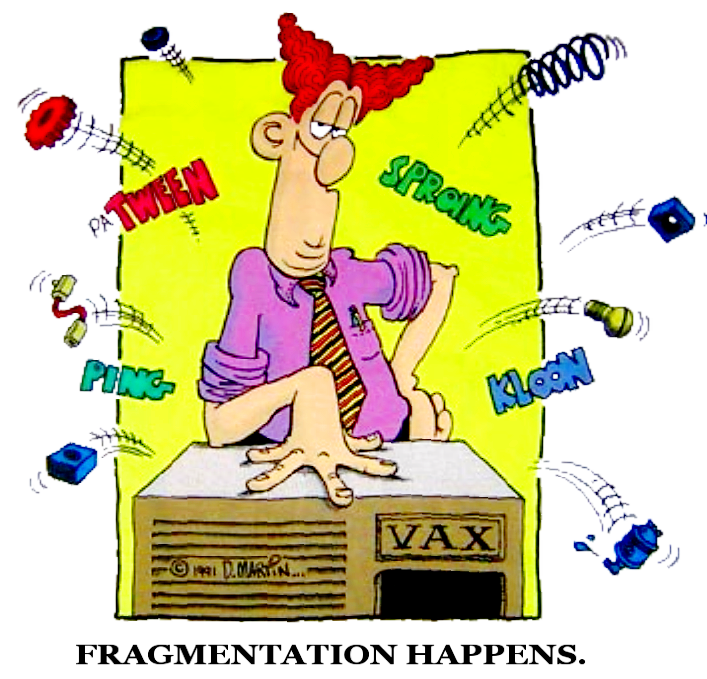 Back in about 1991 one of my responsibilities was the maintanance of some Digital Equipment Corporation VAX workstations, running the operating system VMS. One fringe benefit of this activity was a free subscription to a publication called DEC Professional. One frequent advertiser in DEC Professional was a company called Raxco. Raxco placed one ad that they later regretted. The ad copy proclaimed that simply by filling out and returning a card requesting more information about some of their products, you could get a free t-shirt. This t-shirt featured a cartoon by Don Martin, best know for his work at Mad Magazine. 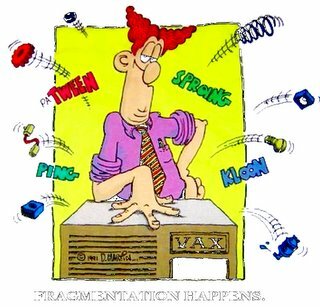 The cartoon is captioned "Fragmentation happens", and features a Don Martin version of a computer engineer with computer parts flying about with sound effects like "Kloon", "Ping", "PA-Tween" and "Sproing". I filled out the card and waited for my t-shirt. This was now about fourteen years ago. One of Raxco's representatives informed me that the response to the ad had been larger than anticipated, so I might need to wait longer before getting my shirt. I have now waited fourteen years. Later I got another business reply card with which I could request product information from Raxco. This time, no shirt was offered. But there was some additional white-space below the check box options on the card. Being careful not to mark any of the preprinted check boxes, I wrote in a new one of my own. It simply said "Where is my t-shirt, you deceitful charlatans?" I placed a large check mark in the box I had created next to this question and dropped the card in the mail. All I received in response to this was some product information that I had not asked for. Why am I bringing this up now? My loving wife found an image of the aforementioned t-shirt and made me a t-shirt using special iron-on paper for inkjet printers. Is this copyright infringement? Perhaps. I would so love to have someone from Raxco try to take the moral high ground on this one. They still owe me a t-shirt. After fourteen years, the interest should run to at least two t-shirts by now. Where is my shirt Raxco? I am still waiting. Jerks. And thank you honey for the beautiful t-shirt. I have wanted something like this for so long. Back in mid November I got a prescription for new glasses at Mountain View Optometry. That was five weeks ago and I was promised that they would call when the glasses were ready. I finally got too impatient and called them today. Apparently their computer indicates that some useless and apparently anonymous retard contacted me by phone two weeks ago. Their computer is a liar. Useless retard. There I said it again. To be fair, my optometrist, Dr. Bell, is excellent. The problem is that they take your payment before they have delivered their product. Many organizations that do this have neither concern nor accountability for the customer experience after the cash register has rung its chime. I am left with a very nasty feeling. The feeling is compounded by an unrelated blunder at Fenders Collision Center that I had this morning. Rant rant rant rant rant rant. There, that does feel better.